Issue 265 of Interzone, Jul-Aug 2016. Immaculate condition. Silveracre has been dealing in the very finest comics and collectibles since 1988. PO Box 114. It will normally be fine if we are notified in advance. We accept Debit/Switch cards. DEBIT/SWITCH CARD. Pre-owned and in a good reading condition for its age. Issue 271 of Interzone, Jul-Aug 2017. Immaculate condition. Overseas (i.e. outside the. ). 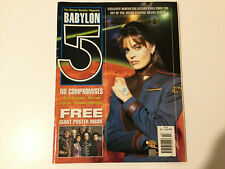 Babylon 5 TV show magazine printed by Titan Magazines. Babylon 5 Magazine No. 1 July 1998. STORIES BY - ERIC S. RAYMOND - MARY A. TURZILLO. " ANALOG " DATE - JULY/AUG 2004 -. AN ISSUE OF THE USA SCIENCE FICTION MAGAZINE. Doctor Who magazine. It may or may not be the copy you receive. The average condition of the british weekly comics we send is fine. Don't worry, we will always get to you! Silveracre has been dealing in the very finest comics and collectibles since 1988. Silveracre has been dealing in the very finest comics and collectibles since 1988. Don't worry, we will always get to you! Add us to yourfavourites list. We accept all major credit cards. CREDIT CARD. Issue 259 of Interzone, Jul-Aug 2015. Immaculate condition.
" ANALOG " DATE - JULY /AUG 2001. 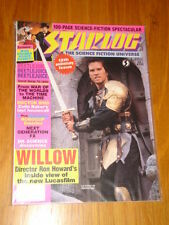 AN ISSUE OF THE USA SCIENCE FICTION MAGAZINE. (Thing) and loads of unusual ads. Sybil Danning. exclusive on Blade Runner, also back cover ad for. Blade Runner, Dolly Parton, Clint Eastwood, The. (light wear to edges, small stress creases to cover spine). Silveracre has been dealing in the very finest comics and collectibles since 1988. It will normally be fine if we are notified in advance. We accept Debit/Switch cards. DEBIT/SWITCH CARD We accept all major credit cards. It will normally be fine if we are notified in advance. Silveracre has been dealing in the very finest comics and collectibles since 1988. Don't worry, we will always get to you! Silveracre has been dealing in the very finest comics and collectibles since 1988. Don't worry, we will always get to you! DEBIT/SWITCH CARD We accept all major credit cards. CREDIT CARD. SING A SPONG OF MALLWORLD – BY SOMTOW SUCHARITKUL. " ISAAC ASIMOV’S SCIENCE FICTION MAGAZINE “ JULY 1980. THE INSIDE PAGES HAVE LIGHT TANNING COLOUR OF THE PAPER - OTHERWISE VERY GOOD, TIGHT BOUND, CLEAN. Silveracre has been dealing in the very finest comics and collectibles since 1988. CREDIT CARD Don't worry, we will always get to you! Stargate SG1 Team Gen Fanzine novel.Fate's Reflection. 364 pages. This Stargate SG1 Fanzine novel is in very good condition with no tears on the pages, just normal signs of reading wear. This is the 3rd printing by Pyramid Press and is 364 pages long and A4 sized. This fanzine is R rated for strong language and violence. The novel itself involves the whole SG1 team and many of the stargate characters but centres on the Daniel and Jack friendship with a twist, when another Daniel and Jack come through the stargate as brothers. It's a long read but a good read! Amazing Stories Jan 1958. Great condition. Vintage science fiction. Amazing Stories Jan 1958. A 60-year-old magazine in excellent condition, with only a small dint at top front of the spine. The interior is clean and sound, with no rust on the staples. SFX MAGAZINE. SUBSCRIPTION COLLECTORS COVER EDITION. Comics for mature readers.Includes the graphic novel Boy Zero, and short stories The Ride, and Bedbugs. In general it is a nice comic. A comic, paperback, or hardcover that has been read but looked after will often be in this grading and it is in my opinion a very collectable grade. Heavy Metal July 1984. Azpiri, Druillet, Bilal, Thorne., John Cleese. ACE Comics - ACE Comics - ACE Comics. ISSU NO 358. DOCTOR WHO MAGAZINE. DATE OF ISSUE JULY 2005. Silveracre has been dealing in the very finest comics and collectibles since 1988. Don't worry, we will always get to you! We accept all major credit cards. We accept Debit/Switch cards. It will normally be fine if we are notified in advance. Don't worry, we will always get to you! Silveracre has been dealing in the very finest comics and collectibles since 1988. It will normally be fine if we are notified in advance. Add us to yourfavourites list. Silveracre has been dealing in the very finest comics and collectibles since 1988. Don't worry, we will always get to you! Add us to yourfavourites list. It will normally be fine if we are notified in advance. Silveracre has been dealing in the very finest comics and collectibles since 1988. Don't worry, we will always get to you! We accept all major credit cards. Sci-Fi Universe Magazine July 1996. New Mag never read. Silveracre has been dealing in the very finest comics and collectibles since 1988. Add us to yourfavourites list. It will normally be fine if we are notified in advance. Don't worry, we will always get to you! DOCTOR WHO ADVENTURES #34 19 JULY - 1 AUGUST 2007 SCARED?